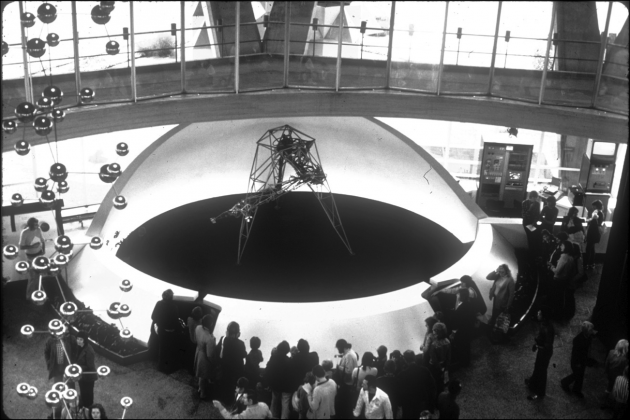 "The Senster, commissioned by the electronics giant, Philips, for their permanent showplace, the Evoluon, in Eindhoven, was a much bigger and more ambitious piece of work than SAM. 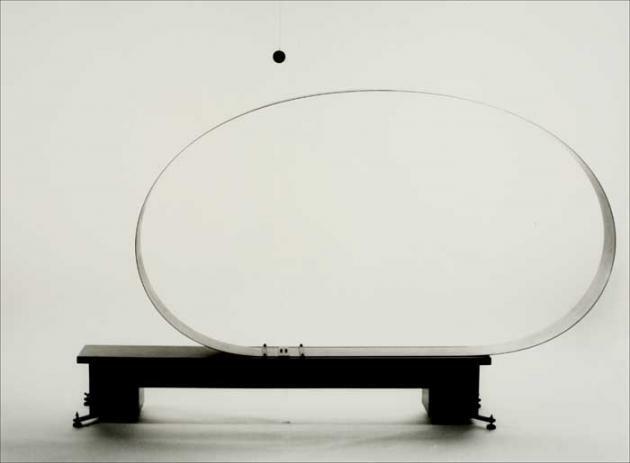 In addition to responding to people's voices, the Senster also responded to their movements, which it detected by means of radar, and was (as far as I know) the first robotic sculpture to be controlled by a computer. It was unveiled in 1970 and remained on permanent show until 1974 when it was dismantled. Its size – it was over 15 feet (4 m) long and could reach as high into the air – made the use of aluminium castings inappropriate, so it was welded out of steel tubing, with the castings employed only in the more intricate microphone positioning mechanism. Its behaviour, controlled by a computer, was much more subtle than SAM's but still fairly simple. The microphones would locate the direction of any predominant sound and home in on it, rather like SAM but much more efficiently, and the rest of the structure would follow them in stages if the sound persisted. Sudden movements or loud noises would make it shy away. The complicated acoustics of the hall and the completely unpredictable behaviour of the public made the Senster's movements seem a lot more sophisticated than they actually were. It soon became obvious that it was that behaviour and not anything in its appearance which was responsble for the impact which the Senster undoubtedly had on the audience." 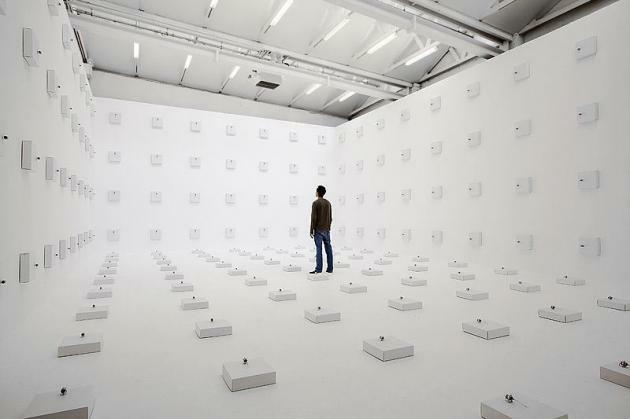 "The poten­tial to be moved by move­ment was Lye's motive force – he con­ceived his sculp­tures as per­formers rather than objects. Hor­rocks sug­gests Lye might have reframed Descartes' dictum by declar­ing 'I move, there­fore I am', and para­phrased Archibald MacLeish's 'A poem should not mean / But be' with 'A film should not mean / But move'. 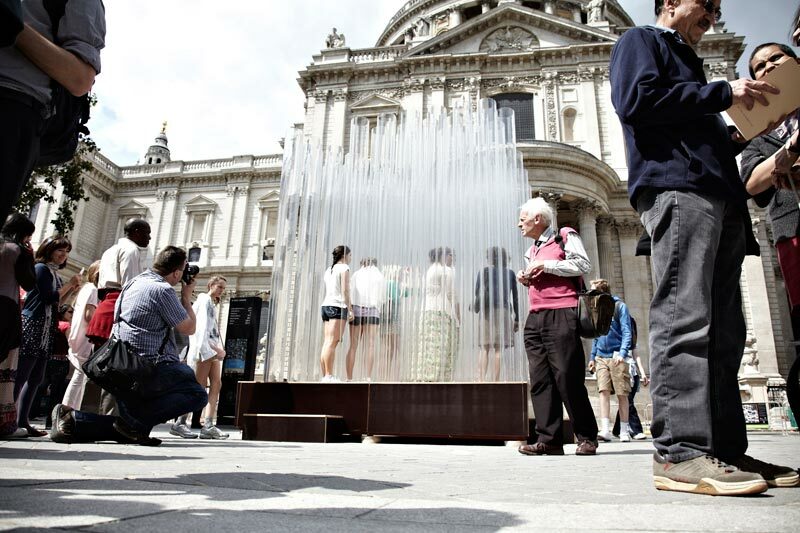 How much atten­tion do design­ers give to 'com­pos­ing motion' through the way their cre­ations move and /or the way people are made to move, and be moved, as they inter­act with them? Lye's prose included at least two explor­a­tions of bod­ily feel­ings and phys­ical sen­sa­tions around chairs." Fig.1 A clip from Flip and Two Twisters a documentary about Len Lye the New Zealand born kinetic artist and filmmaker. Directed by Shirley Horrocks. Fig.2 The kin­etic sculp­ture Uni­verse. The striker ball is sus­pen­ded above the steel loop, which has just rolled over to one side. Photo Brian East­wood. 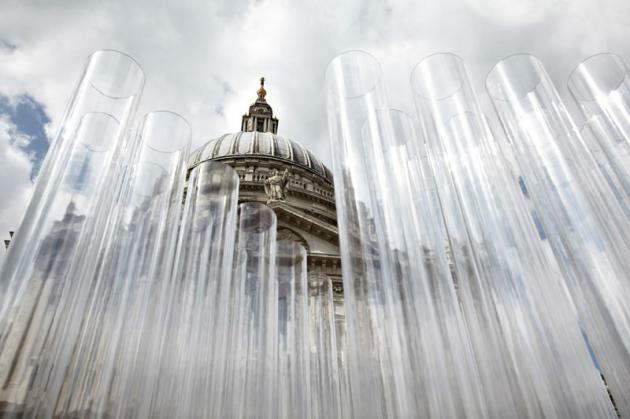 Cour­tesy Len Lye Foundation.